What are the chances of getting into an LAUSD magnet? As the number of independent charter schools in Los Angeles has grown and students have left the district, one of LA Unified’s key strategies in fighting the enrollment slide has been to promote and build its magnet programs. Declining enrollment is what’s behind the district’s new unified enrollment system, and the demand for magnets was brought up during the heated discussion at last Tuesday’s school board meeting before the vote approving the first phase of the system. One question during the discussion was how many students are on wait lists for magnet programs — there were 24,487 for the 2016-17 school year. For the 2016-17 school year, the district received 72,515 applications for 27,570 magnet openings, so about two in three students who applied to a magnet program were not accepted. Meaning, the chance of getting into a magnet program last year was 1 in 3. 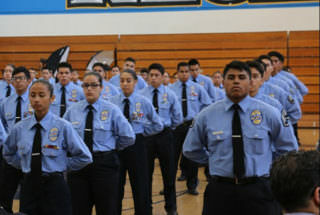 • Read more: Are magnet schools the answer to LAUSD’s enrollment problem? In comparison, the waiting list for independent charter schools in LA was 41,830 in the 2014-15 school year, the most recent data available from the California Charter Schools Association. A CCSA spokesman said they do not have a more recent figure and are not planning to update it. There were 107,142 students enrolled in 228 independent charter schools this year, according to district data. Independent charter schools are open to all students. Enrollment is based on a lottery system. There are no eligibility requirements. Magnets are open to all students in LA Unified, but students are admitted based on a points-system and a random draw. Students get into a magnet program based on the points they’ve accumulated. Points are based on matriculation from another magnet program, students who live in Predominantly Hispanic, Black, Asian, or other Non-Anglo (PHBAO) designated areas (the purpose of magnets was to integrate racially segregated schools in the 1970s), if a student lives in an area where schools are overcrowded, or if a student’s sibling or siblings attend the magnet school. Students also receive points for applying to a magnet and being put on a waitlist. So wait lists are likely inflated as students apply to magnet programs just to build points. Students can pick up to three choices for magnet schools and can be offered a spot in their second or third choices if they don’t get into their first choice. Some magnets have additional eligibility requirements. For example, students who attend gifted and high-gifted magnets must be able to complete coursework two years above their grade level and be tested by a psychologist as gifted. Magnet programs are also focused around specific subject areas. The majority of programs are geared toward STEM subjects (science, technology, engineering, and math). Magnet schools will be part of the first phase of the district’s unified enrollment system that is scheduled to be launched in the fall. Independent charter schools will not be part of it for at least the first two phases.